In Victorian London, Amelia Wishart lives a miserable existence in a small flat with her dying mother, who had worked as a chimney sweep. Amelia takes up the job, but meets with disaster while cleaning Mr. Creeper's chimney. It's horrible news, therefore, when her mother tells her that Amelia will be taken care of when her mother passes... by Mr. Creeper. Creeper manages the local work house, which has all of the components of a Dickensian novel; gruel, washing floors, and quantities of downtrodden orphans. Amelia is different. During the past Christmas, she was visited by none other than Santa Claus himself, and was given a bit of hope that things would be okay. She also has the comfort of her cat, Captain Soot, but loses all hope when Creeper forces her into the work house and makes her give her cat to none other than Charles Dickens, whom she sees on the street. At the North Pole, Amelia's plight is having an impact. There is a vicious troll attack on the elf village, Elfhelm, and Santa does not seem to have enough magic to get his sleigh air born. Santa decides that the best way to get magic back is to find some hope in the world, and he believes that this hope resides with Amelia. He takes his sleigh as far as London on Christmas Eve, and looks for the girl. Will he be able to find her in time to deliver presents to all the children of the world? Strengths: The Victorian London setting is appealing, and the illustrations by Chris Mould have their moments. Including Charles Dickens as a character works as well; it sounds as if the man did travel about a bit, so it's possible he might have run into a child such as Amelia. The details of the elf village and the personalities of the reindeer all add to the mythology of Santa. Reading this would not convince any younger child that Santa was not real. Weaknesses: This had some really sad moments, and the plot device of having Christmas imperiled is not really new. 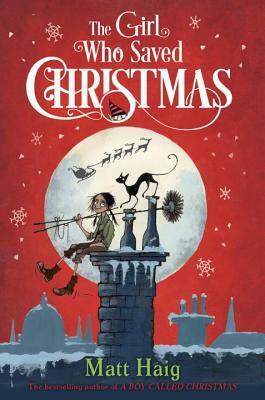 What I really think: There aren't a lot of middle grade novels about Christmas, and children ask. This might be more popular in elementary schools than in middle schools.